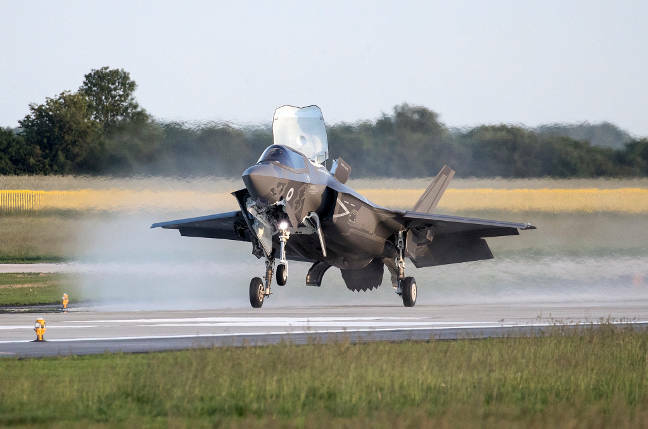 Britain's first permanently based F-35B fighter jets have arrived at RAF Marham in Norfolk – as a US auditor warns that the aircraft won't be deemed "mature" until the year 2021. 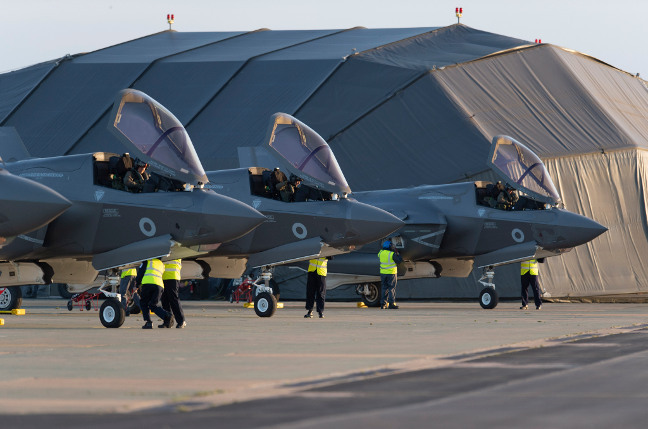 Four of the brand new supersonic stealth aircraft arrived at RAF Marham in Norfolk yesterday evening, having crossed the Atlantic nearly nine hours after taking off from US Marine Corps airfield Beaufort in South Carolina, USA. 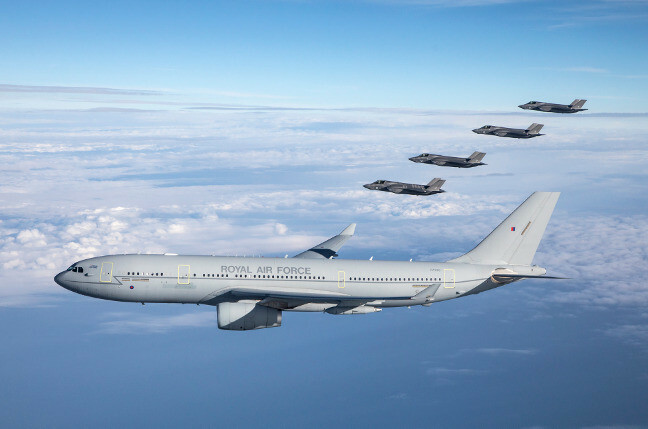 The Lightnings, as the F-35B will be known in British service, were accompanied on their flight by three RAF Airbus A330 tankers – one at the US end, with two more near the eastern North Atlantic – and an A400M Atlas transport aeroplane providing air-sea rescue cover. Air Chief Marshal Sir Stephen Hillier, the RAF's Chief of the Air Staff, chipped in: "If you can’t see us coming, you won’t be able to stop us, so with its stealth and other world-beating technologies the F35 Lightning takes the Royal Air Force and Royal Navy to a whole a new level of capability." Admiral Sir Philip Jones, the First Sea Lord (head of the Royal Navy), added that the F-35Bs are intended to be flown from the UK's two new aircraft carriers to project British power abroad, saying: "Once combined with our new aircraft carriers, HMS Queen Elizabeth and her sister ship HMS Prince of Wales, these extraordinary jets will sit at the heart of our country’s globally deployable expeditionary forces and provide the potent conventional deterrent we need to ensure our national security." The F-35Bs are capable of landing vertically but yesterday they used the full runway like other conventional aeroplanes. The US Government Accountability Office issued a report earlier this week warning that the F-35B is still well behind its designed reliability targets and will only be fully signed off in 2021 – the same year the UK will deploy them for the first time, alongside the USMC. That report (PDF), while revealing encouraging signs of progress, also disclosed some problems. The American government measures F-35 development progress with eight key reliability and maintainability measures. 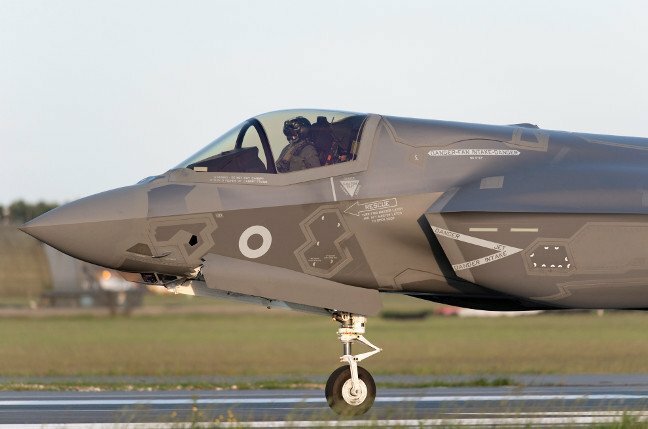 Of these eight, the F-35B – the short takeoff variant of which the UK is buying up to 138 – was "near or above current targets" for just one measure. On the remaining seven measures – which included targets for mean flight hours between maintenance event, mean flight hours between critical failure and mean corrective maintenance time for critical failures – the F-35B was below the target. On three measures it was deemed to be "near or above minimum targets", which appears to be a useful way of classifying a near-miss. Mean time between failure is a standard engineering measure of reliability. Though the GAO did not reveal the precise target, or by how far the aircraft had missed it, that the F-35B cannot meet the standard is concerning. Of even more concern is the revelation that there was "little improvement in reliability and maintainability over the past year". Aircraft maturity is also an area of concern, in the GAO's eyes. Expressed as a number of flight hours across the whole fleet, in plain English "maturity" means how long the design has been operated for and therefore how much knowledge has been built up about its maintenance requirements. An immature design, as the GAO pointed out in October last year, means one where "sustainment costs and technical characteristics such as reliability and maintainability" are not fully known, meaning they cannot be predicted or fully scrutinised. The auditor warned that the F-35B and F-35C (which the UK is not buying) are "less mature and will need to fly approximately 46,000 and 38,000 hours, by 2021 and 2024, respectively, to reach maturity". An MoD spokesman told The Register: "The F-35 programme remains on track, on time, within costs and offers cutting-edge capability to help our Armed Forces keep us safe. This report highlights areas for improvement that the US Joint Programme Office has assured us that they are already working on. We continue to work closely together to deliver and support this world-leading fighter jet."